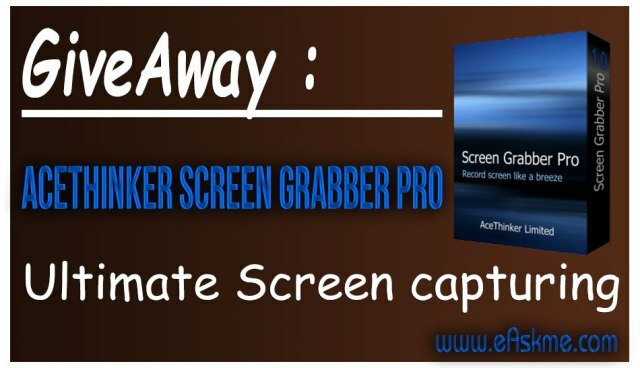 After the success of NordVPN Giveaway, I am back again with AceThinker Screen Grabber Pro Giveaway (FREE). I have been sharing discounts and deals on eAskme from long time, But today i am going to talk about something which is absolutely free and make you stand with latest technology. There was a time when people were using PrtScr button to take screenshots. With the technology and time things have changed a lot and now we have various screen capturing tools with ultimate customization features. Now you can not only capture screen as images but also record videos using screen capturing software. Capturing screen helps you to create tutorials, which helps a reader really easily understand how to go step by step. Screencast video makes it more effective and easy. Now a days people are more interested in watching a video tutorial than just reading the content. So you may not just need screenshots but you also need a screen capturing tool which is best to create video tutorials. Videos not only save a lot of time but also help you to make content easily understandable. What you can learn from a book in 15 minutes, you can learn from the video in just 2 minutes. Today I am going to share about of the best software to capture screen of your windows or Mac computers/laptops. Actualy cost of Acethinker Screen Grabber Pro is $29.95. It is 100% compatible with Windows and Mac systems. I know that Black Friday and Cyber Monday has gone, but don`t worry, still I have something for which you need not to wait for any discount. 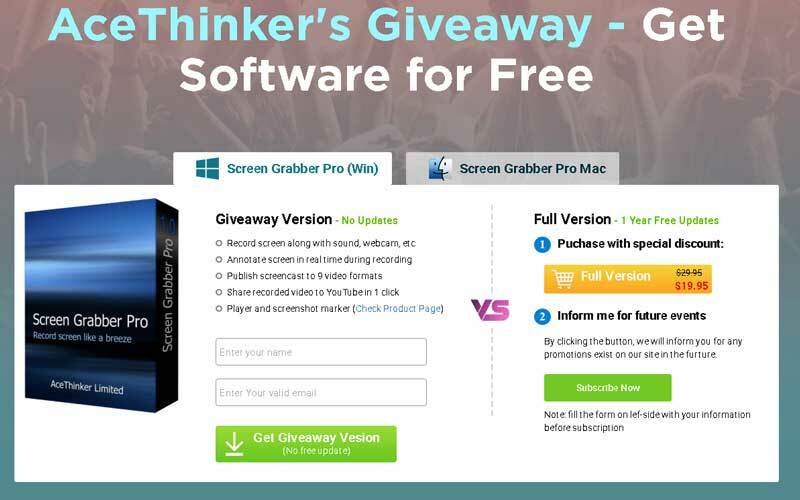 Just follow my tips and this giveaway will offer you AceThinker Screen Grabber Pro for free. At eAskme, are running an absolutely free Giveaway for Acethinker Screen grabber pro. That means this is your only chance to have a premium screen capturing software worth $29.95 for free. 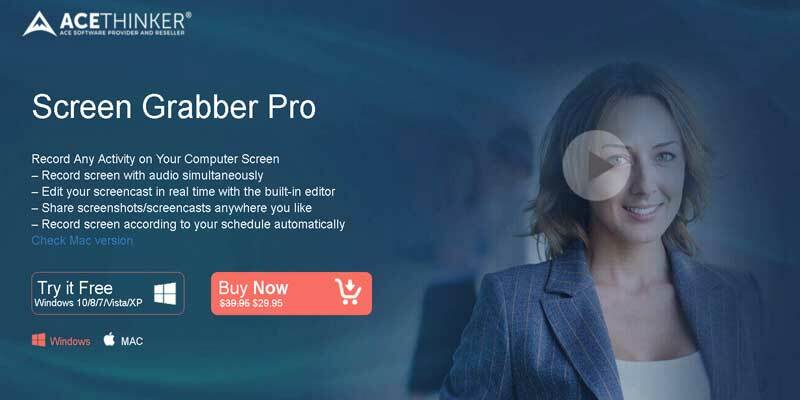 Acethinker offer 5 keys of screen grabber pro software and each key cost $29.95, which we are giving you absolutely free. Leave a healthy comment about Acethinker Screen Grabber Pro Giveaway in comments below. Do it and I will give you Access to grab AceThinker Screen Grabber Pro for free. Screen capturing is a habit of every single person these days. Sometimes you need to capture some error or some reports that you cannot download or create screencast video, for all your screen grabbing purposes you need Acethinker Screen Grabber pro. Here I am sharing the excellent features which may make you fall in love with this screen grabbing tool. Audio Input Options : This is good for you as it let you choose the mode of audio input for recording. Around Mouse : Record the area where mouse is moving. Full Screen : Records the full screen. Region For Screenshot : Choose area for capturing. Region For Video : Video capture option with pause and stop buttons. Web Camera : Record your own video. Only Audio : Record only audio. Upload : Directly upload on Youtube. So you see you not only can capture screen and record videos, but also upload your recorded video on YouTube and share among your friends or family or with the world. So what are you waiting for, Your absolutely free deal to grab an awesome screen grabber pro software is here. 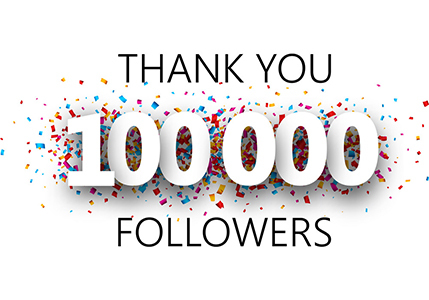 Don`t forget to share it with your friends and family and give them a chance to Win Acethinker Screen Grabber Pro. Don`t forget to leave your valuable comments.